The New York Times Bestseller that explores animal intelligence and will alter the way we as humans view other species. Have you ever wondered what it is like to be a fish? Or a parrot, dolphin, or an elephant? Do they experience thoughts that are similar to ours, or have feelings of grief and love? These are tough questions, but scientists are answering them. They know that ants teach and rats love to be tickled. Theyve discovered that dogs have thousand-word vocabularies and that birds practice their songs in their sleep. But how do scientists know these things? Animal Wise takes us on a dazzling odyssey into the inner world of animals and among the pioneering researchers who are leading the way into once-uncharted territory: the animal mind. Morell uses her formidable gifts as a storyteller to transport us to field sites and laboratories around the world, introducing us to animal-cognition scientists and their surprisingly intelligent and sensitive subjects. She explores how this rapidly evolving, controversial field has only recently overturned old notions about why animals behave as they do. In this surprising and moving book, Morell brings the world of nature brilliantly alive in a nuanced, deeply felt appreciation of the human-animal bond. 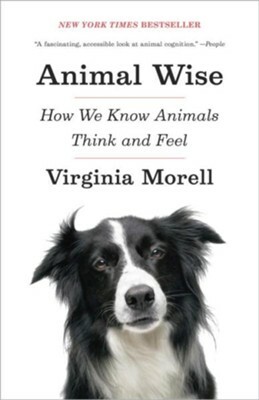 "Morell passionately and consistently proves her point in this frequently fascinating study of animal behavior&hellip;. [She] is a gifted writer with a deep knowledge base that never talks down to the reader or the academic communityno small feat." "A delightful exploration of how animals think&hellip;.Morell makes a fascinating, convincing case that even primitive animals give some thought to their actions." "The scientific expertise Virginia Morell provides to this very important subject, and the way she ties this in with the researchers who know their animals  because knowing them is their life work  make this an important book and a great read." I'm the author/artist and I want to review Animal Wise: How We Know Animals Think and Feel.